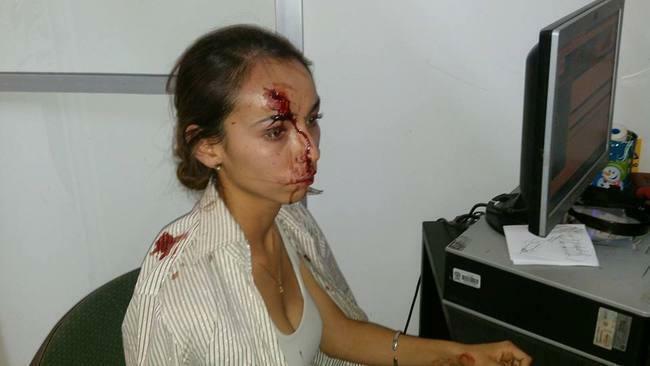 Mexican journalist Karla Silva was brutally assaulted in her office in Guanajuato last year. Ever since the Mexican government declared war on the nation’s drug cartels in late 2006, it has consistently been ranked among the world’s most dangerous countries for journalists. The constant threat of retaliatory violence against reporters who cover drug cartel activity has led many newspapers to censor themselves. This, along with the social media boom, has fuelled a wave of citizen journalism, with many Mexicans now reliant on brave but anonymous bloggers for local security news. According to government statistics, 102 journalists were murdered in Mexico from 2000 until April 2014. At least another eight professional journalists were reportedly murdered and two more went missing since then, bringing the total number of reporters that were killed or disappeared last year to at least 14. There is often a clear link between reporters’ work and their fates. In an investigation into the murder of 28 journalists in Mexico, non-profit organisation Committee to Protect Journalists found that 82 percent had covered crime, 32 percent had covered corruption and 18 percent had covered politics. Although drug cartels are believed to be behind most murders, the lines between organized crime and corrupt officials are often blurred. Press-freedom watchdog Article 19 noted last year that public officials were allegedly responsible for 59.3 percent of the 330 documented acts of aggression against journalists and media outlets in Mexico in 2013. While foreign correspondents are very rarely targeted, most victims are reporters at local or regional newspapers. The killings are heavily concentrated in five of Mexico’s most lawless states: Chihuahua, Veracruz, Tamaulipas, Guerrero and Sinaloa. With local outlets left with little recourse but to self-censor for their own safety, this has meant such areas become black holes for reporting. Citizen journalists have tried to cover the void through regularly updated blogs and social media accounts, but they too run huge risks. Several bloggers have been murdered for writing about drug gangs in recent years, while “Lucy”, the mysterious female author of Mexico’s most read drug war site, Blog del Narco, has been forced into exile for her own protection. Likewise, in late November, the anonymous administrator of Valor por Tamaulipas, a Facebook page with over 500,000 followers that provides security updates in the northern state, announced his retirement. The administrator, who had a price on his head courtesy of one of the cartels, said he was opting out for “personal reasons” although he has since resumed work on the site. The previous month, one of his colleagues, María del Rosario Fuentes Rubio, had been kidnapped and murdered. Her killers published images of her blood-splattered corpse on her Twitter account and warned others not to follow her example. That gruesome spectacle was typical of the way that killers have sought to achieve maximum exposure in recent years, whether by hanging mutilated bodies from public bridges or posting grisly execution footage online. Despite such horrific setbacks, Valor por Tamaulipas and many other sites keep on bravely publishing the latest gory news. But with little protection from authorities that are either unwilling or incapable of guaranteeing their safety, the future looks bleak for Mexican bloggers and journalists alike.